Have you ever heard of the legend of the Lightning Horseman? According to fables that go around the casino realm, he was born on Halloween Day… or perhaps reborn! No one has ever seen him since his mere shadow is enough to send chills on the citizens of the virtual realm. 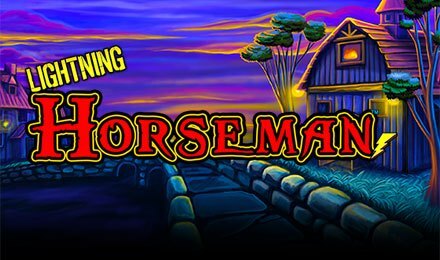 For the first time ever, the lightning Horseman arrives on this dynamic slot game by Lightning Box. Named Lightning Horseman Slot, it promises to zap your senses with excitement and adrenaline rushes. Ready to wallow in the many features concealed inside this five-reel slot game? Start playing Lightning Horseman Slot by accessing the slot game through your Wicked Jackpots account. This slot game is just like the others. You will need three or more matching symbols on the reels to obtain a win. Be ever ready to come across symbols such as; Crow, Lady with Red Cape, Treasure Chest, Lantern Guy, Wooden House,A, K, Q and J. You can adjust the bets according to your preferences as well. Bet Levels: Unfortunately, there are no Bet Levels available on this slot game by Lightning Box. Amount of Paylines Selection: Lightning Horseman Slot offers 40 pay lines throughout the game. There 40 pay lines are always active. Coin Values: Feel free to change your stakes at any time of the game. However, you cannot change bets values during Features. You are allowed to set your bets from a minimum of £0.40 up to a maximum of £50.00. You can change the values by clicking on the plus or minus button on the user interface tab. The Lightning Horseman Symbol is the Wild Symbol of the game. It can substitute for any other symbol of the game bar the Lightning Bolt Symbol. Plus, this is the highest paying symbol of the game, awarding 600x your current stakes. The Lightning Bolt Symbol is the Bonus Symbol of Lightning Horseman Slot. It helps in the activation of the Lightning Re-Spin Feature. If you land 6 or more Bonus Symbol, you activate this feature. All Lightning Symbols will be locked in place and you will be rewarded with 3 Re-Spins. For any bonus symbols obtained during the feature, the count of re-spins resets to three and the extra bonus symbols gets locked in place as well. The feature ends when the reel is filled with bonus symbols or the re-spins are over. At the end of the Re-Spin feature, all bonus symbols are swapped into cash prizes and rewarded to the player. You can also activate four jackpots, Minor, Mini, Major, Grand. The Grand awards up to 62,500 coins. Ready to face the Lightning Horseman? Good luck, players!